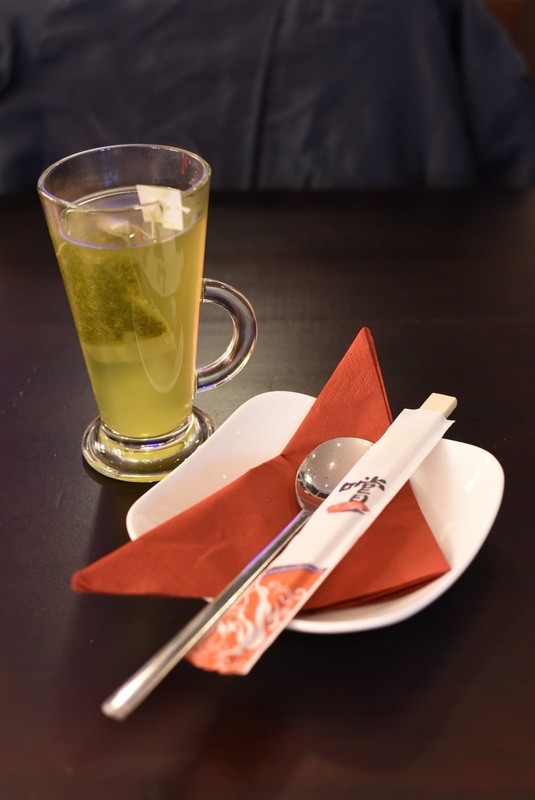 Leeds has a number of oriental cuisines covered, whether it be Chinese, Thai, Japanese, Indonesian and Malaysian food being quite easy to get your hands on. 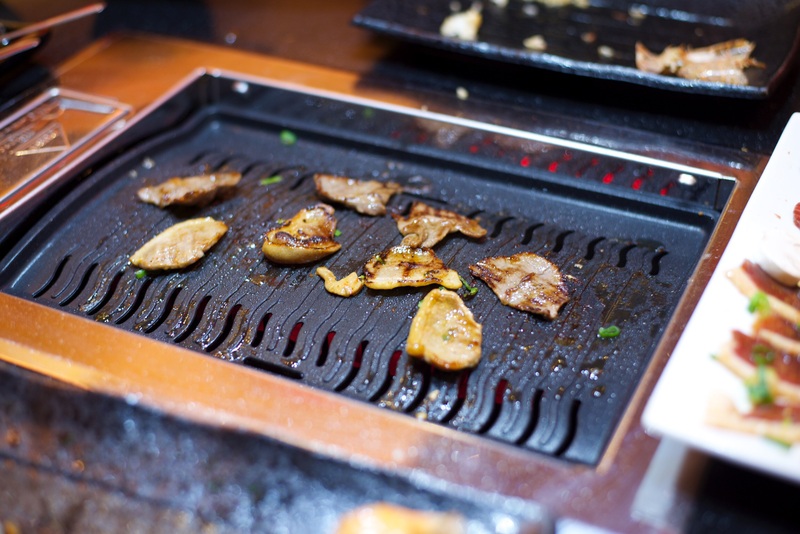 However, the same couldn’t be said for Korean, this was until Bulgogi Grill opened last year. 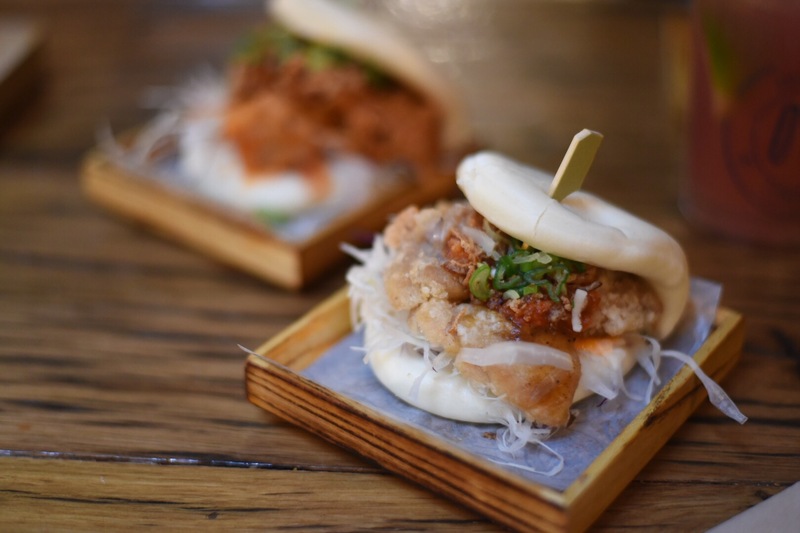 Korean food is something I’ve dabbled in, but not to a great extent, so news of this opening put the place straight onto my to visit list!! Months passed still without a visit, then after trying my first Bibimbap a few weeks ago down south, it reminded me that Leeds had its very own Korean spot to try out. 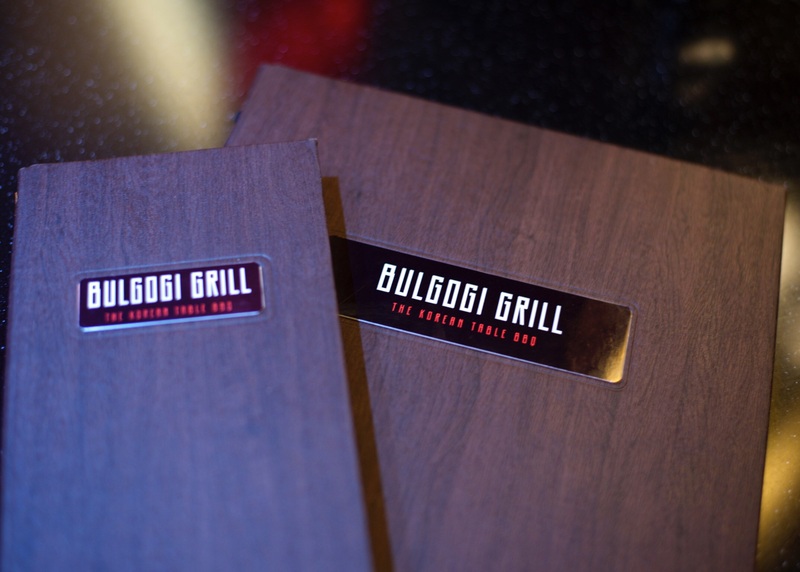 Bulgogi Grill has become part of the improving Merrion Centre, adding to an increasing list food and drink venues, making it a good spot for those visiting the First Direct Arena being just a stones throw away. Recently a friend and I made it our mission to go and get our fill, with a number of positive reviews already written about the place, it promised much. Having not taking the time to book, we could’ve easily been scuppered as the arena had a gig on, but we snagged a table they were clearing as we walked in. 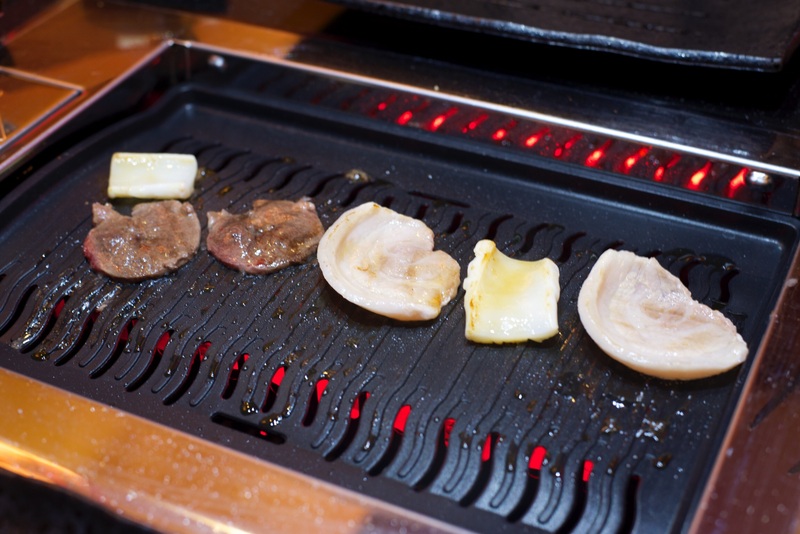 One of the first things that greets you, apart from the staff was the smell of grilling meat and the marinade. 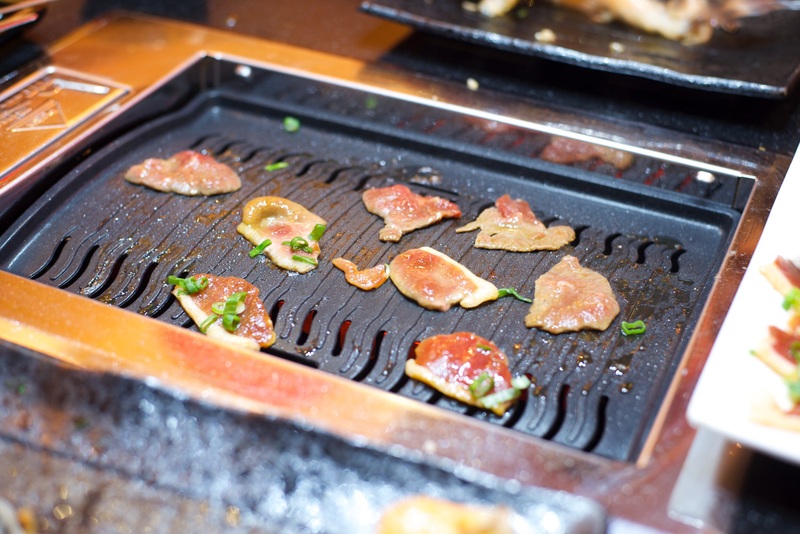 If my mouth wasn’t already watering at the thought of chargrilled meats, then the waft of smells on entering the building was seriously more than enough to do it!! 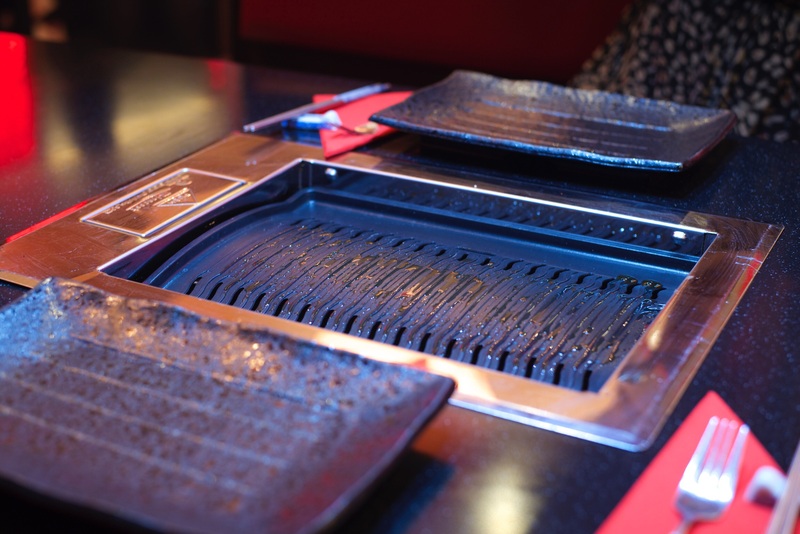 The restaurant itself is filled with intimate booths, each with a dedicated extractor fan hanging down from the ceiling and a grill which can reach up to 300°C! 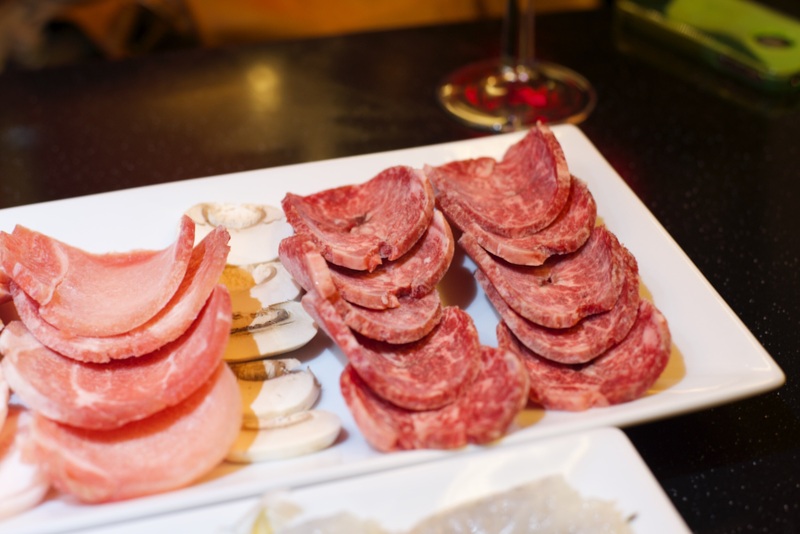 For £22.95 each, the evening menu comprises of a starter with two different items (dumplings and kimbap), then an assortment of different meats and seafood for the BBQ, accompanied by a whole host of sauces, rice, lettuce and side dishes. 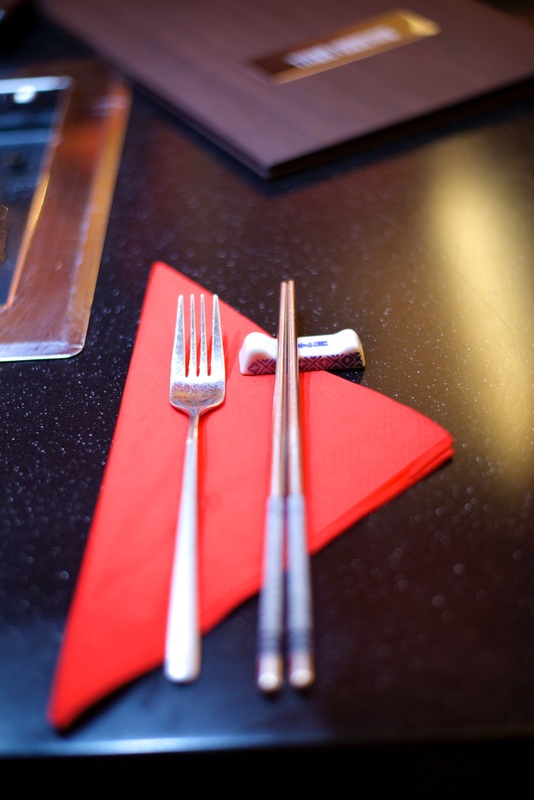 From the outset the staff were great, making us feel comfortable and this continued throughout our evening. As the evening panned out they were present without being overbearing, observant enough to check if any side dishes needed topping up, and every now and again they’d alter the temperature on the BBQ. 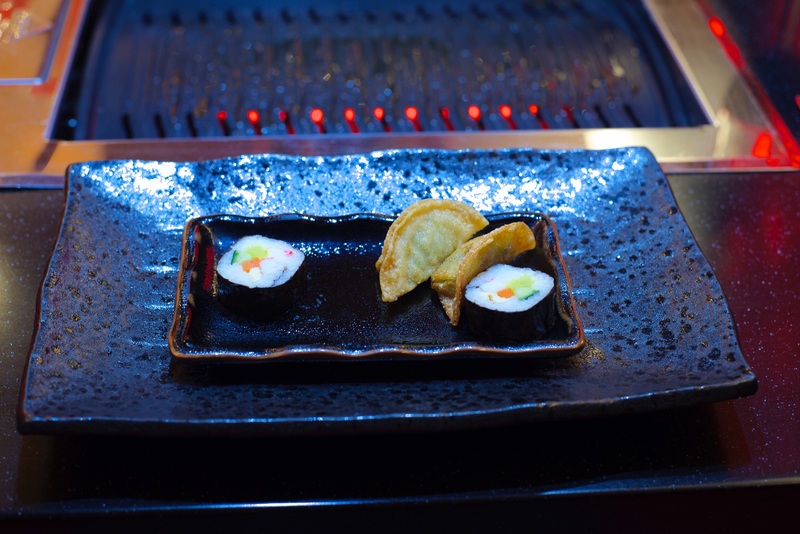 To start there’s just one choice; the vegetable mandu dumplings with kimbap. 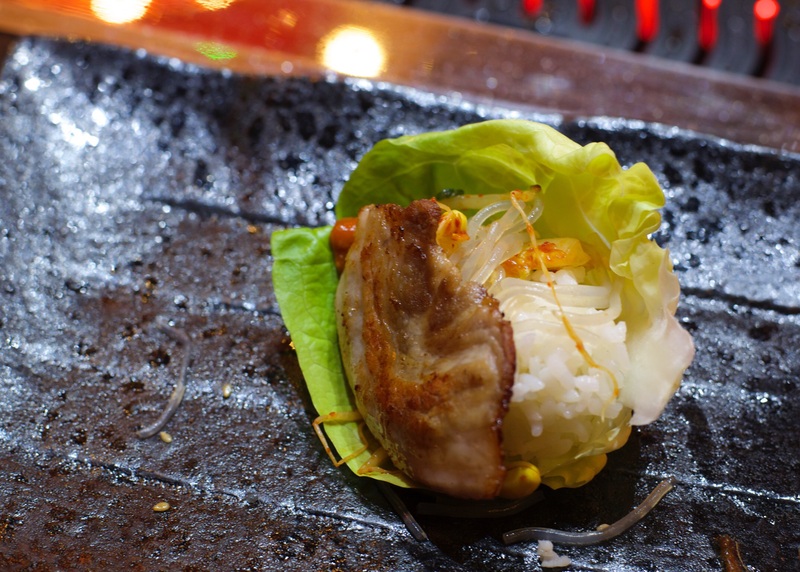 The dumplings were crisp and tasty, probably overshadowing the kimbap, the korean version of a sushi roll. As we received two of each on a plate per person, it seemed at the time quite slim pickings and lasted a couple of minutes to polish off. 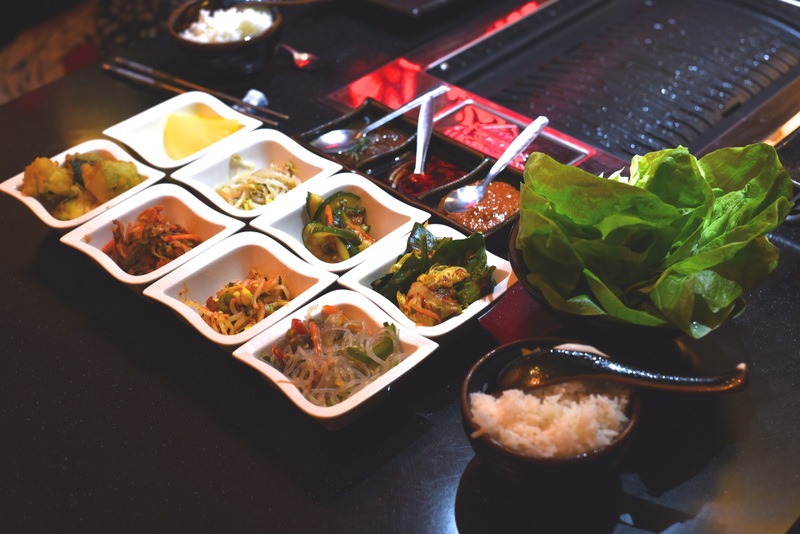 Next up the main event, staff started to bring out a whole plethora of items in small bowls (banchan), including deep fried courgettes, pickled vegetables, kimchi and vermicelli noodles, alongside a selection of sauces, rice and lettuce. Now even before we’d stepped into the restaurant my friend had proclaimed that she wanted ‘meat’ and this was exactly what we got!! 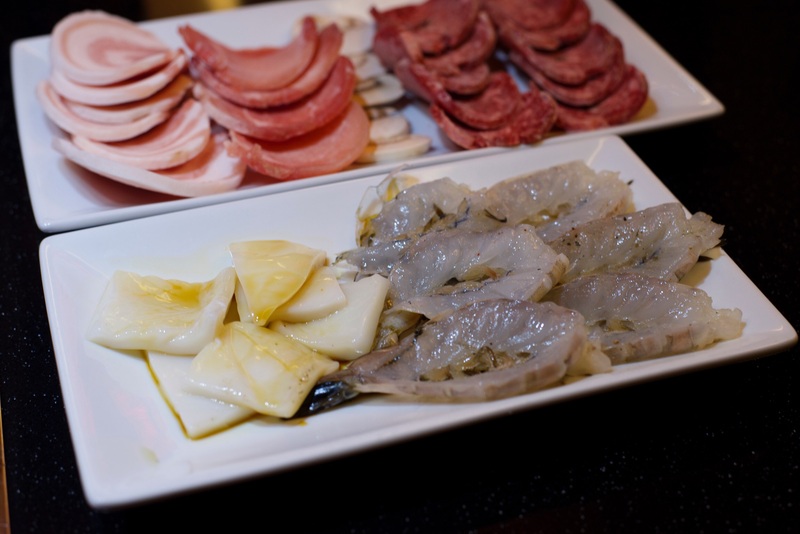 Bringing out beef lightly brushed in sesame oil, slices of pork, seasoned prawns and squid seasoned with a Korean soy sauce. 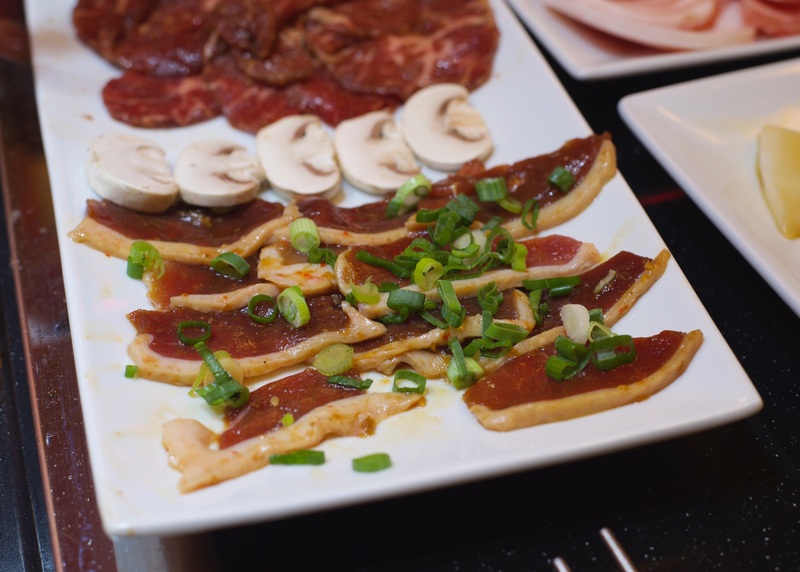 Finally the Bulgogi beef and duck which are their specialities, where the meat is prepared in a delicious marinade. 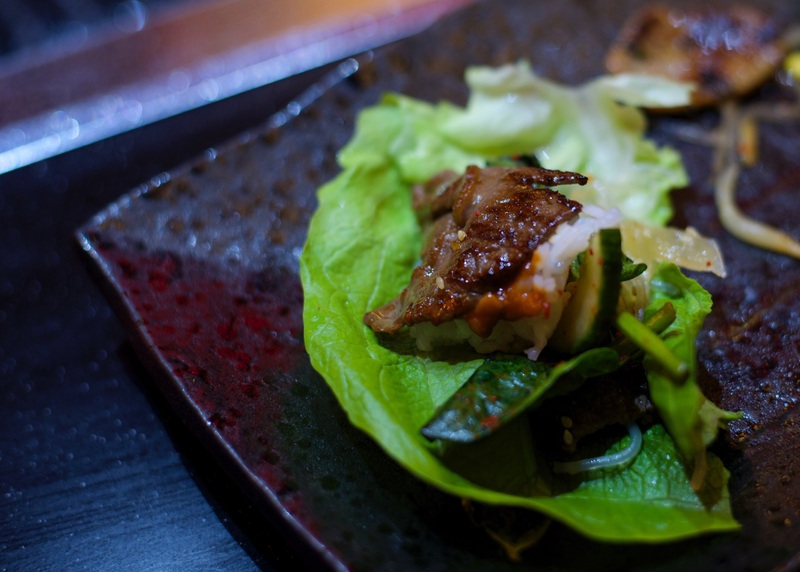 The concept is pretty simple – cook your protein of choice as you desire, then wrap it in lettuce with rice and whatever accompaniments you choose. After I’d stopped being greedy and filling the lettuce too much, I got the knack and thoroughly enjoyed the experience!! If I was to find fault it would be that I expected the kimchi to have more punch, it had plenty of flavour, but the distinctive fiery kick was missing. 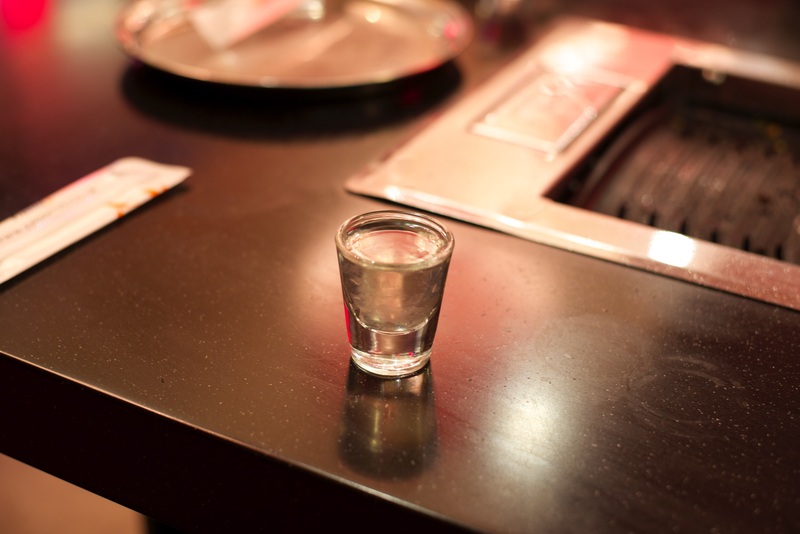 To finish we were given a shot of Aloe water to help clean the palate. I’d definitely go again, I really enjoyed the whole cook your own thing and they don’t scrimp on portion sizes. A few friends of mine had been put off by the price, but I think the amount of choice on offer and the refillable extras makes it very much worth it! 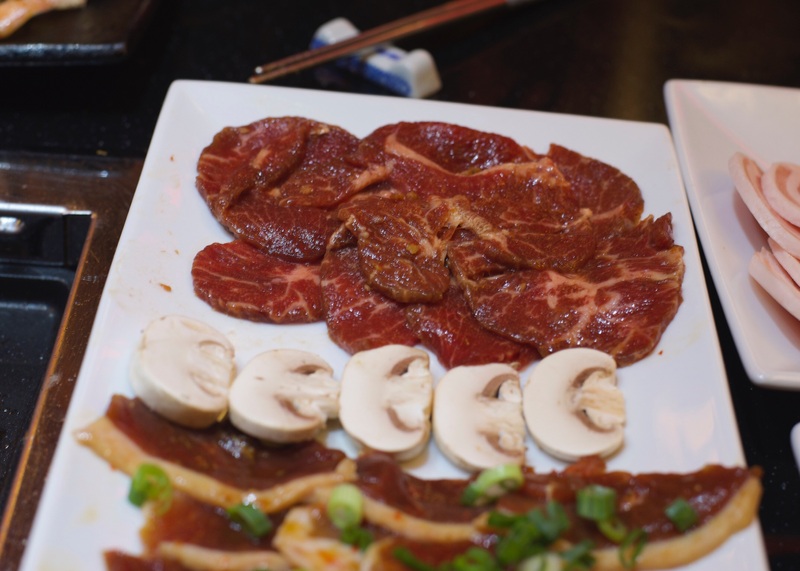 We’d hardly eaten all day, keeping ourselves for Bulgogi and neither of us could finish everything! We ordered the whole menu for two people, but to be honest we would’ve been very happy with a portion for one, and just use lots of the extras! Yeah, some people may think why go to a restaurant where you have to cook your own!? Not that every meal out I want to cook my own food, certainly not, but I do think it adds to the experience and at least you can cook your food exactly how you want without any fuss! Also for those who may want a meat-free option, they can cater with a vegetarian menu, they just need 24hrs notice ! Last weekend I was back down south with a couple of aims; to catch up with loved ones, but also to run myself stupid in the Bath half marathon. The other half had plans of his own Friday evening, so as far as eating out went I had to settle for dining alone, this idea of solo dining may not be to everyone’s liking, but it suits me down to the ground and I enjoy it. 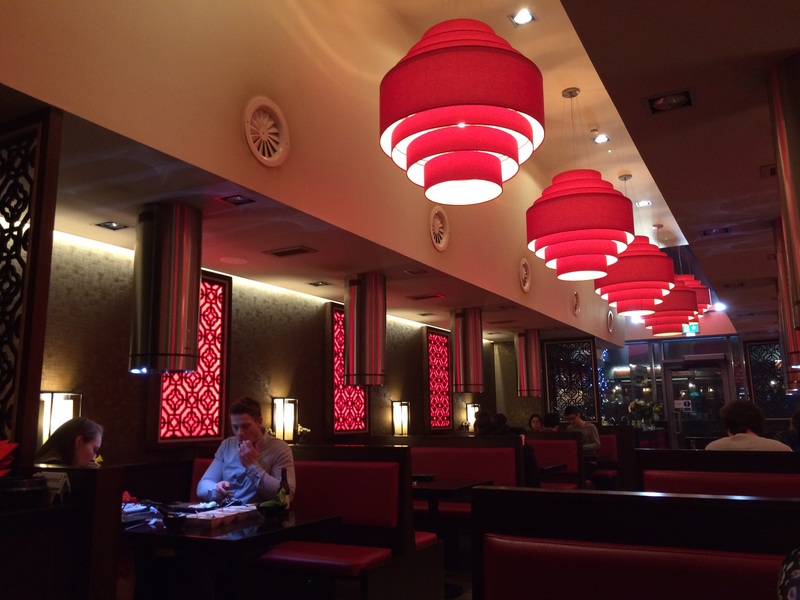 On my to-visit list were a couple of spots which were closed last weekend, such as the Asian restaurant Soya. The plan was to slowly carb-up in readiness for trudging around the streets of Bath so something noodle or rice based would be ideal! 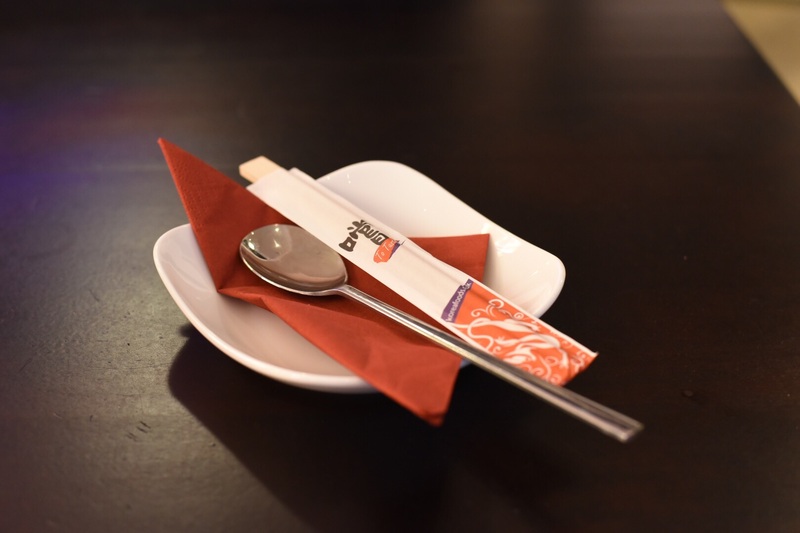 Soya specialises in Korean and Japanese food in Woking, its diverse menu includes sushi in various guises whether it be sashimi, sushi rolls….I’m sure you know the drill. 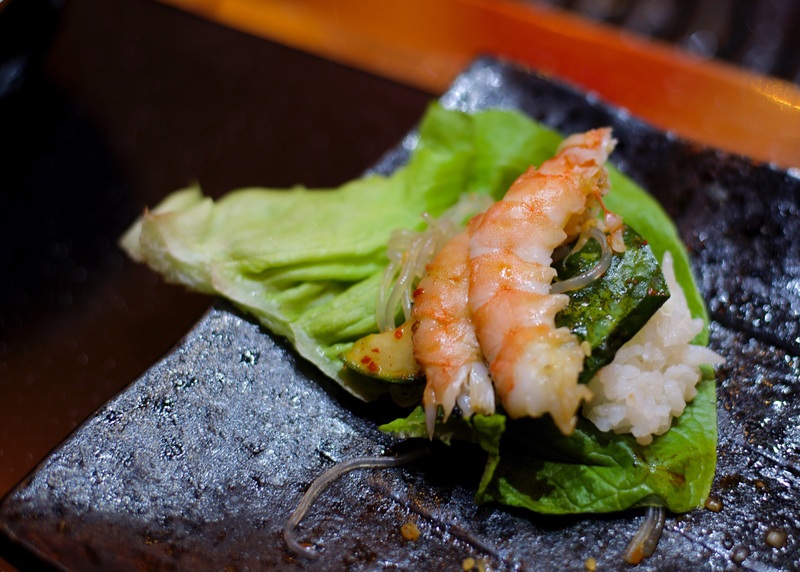 Also on the Japanese side were katsu dishes and starters such as edamame or tempura, but what really caught my eye were the things I hadn’t tried before. Instead veering towards the Korean dishes, in particular the bibimbap, I’d missed out when Trinity Kitchen had street food trader Yogiyo selling them, and I’m yet to visit the Bulgogi Grill (which needs rectifying soon), so this was the perfect opportunity! I could take as many photos as I wanted without getting the death stare and enjoy it in my own time! Now drinks-wise normally I’d be the first to order wine, but I was frankly knackered so a soothing green tea would have to do the trick. Arriving a couple of minutes later, I was actually glad I’d gone for a hot drink, as outside was a tad on the chilly side. Recently I’ve been enjoying a bit of dumpling fetish, so even though quite a few starters could have made the cut, such as Okonomiyaki I was after more dumpling action. 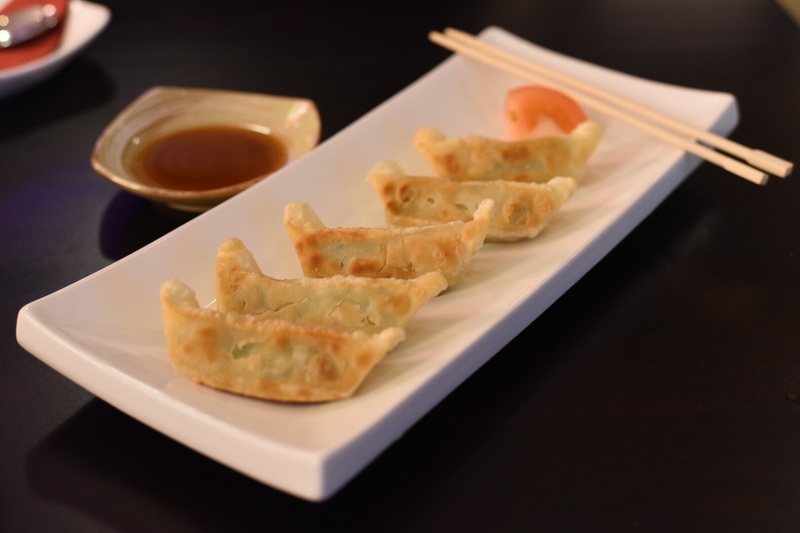 With this in the back of mind, my eyes were drawn to fried prawn mandu dumplings (£6.50). 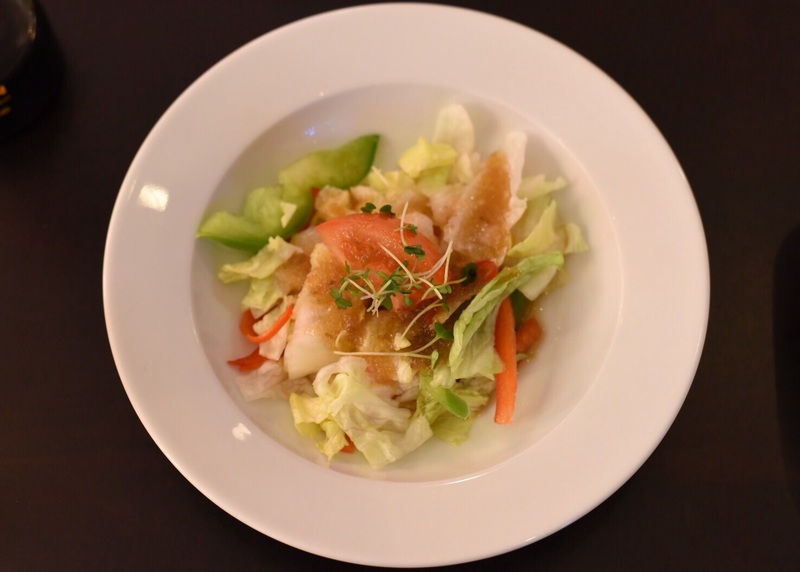 To start with a bowl of salad came my way, simply made with lettuce, tomato, peppers and an unusual dressing which I couldn’t quite put my finger on, but it had a sweet and sour taste. This was perfect for grazing through the meal and acted as a bit of a palate cleanser. Shortly after came the mandu, pan fried and made with juicy prawns and some sort of greens, I think it may’ve been cabbage. 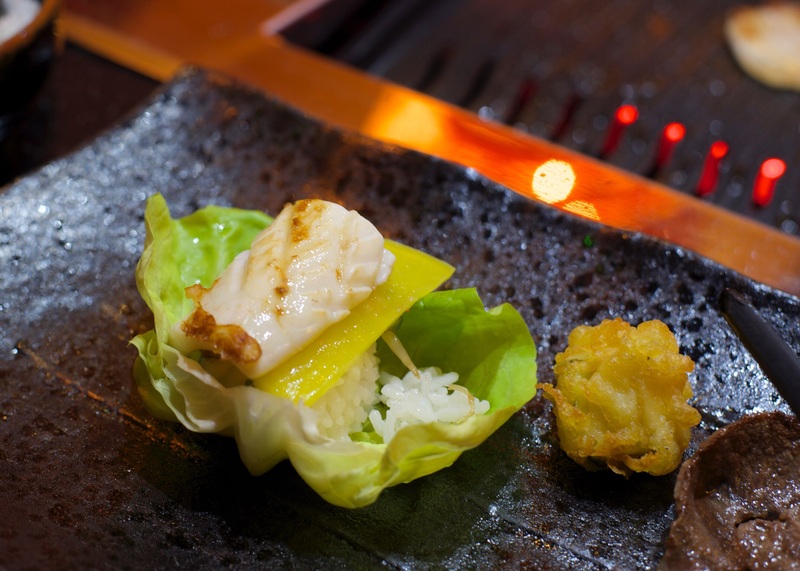 Lightly fried leaving the wrappers crisp and golden on two sides and soft on one, a light soy was an obvious choice as an accompaniment but for good reason; perfect to season without overpowering. It made for an excellent opening gambit. At Soya you can do the whole bulgogi thing, which would’ve been incredible if I’d been with other people, to do the whole cook your own!! Even though I love eating out solo, it may’ve been a step too far, so instead I went down the Bibimbap route. I’d heard loads about them and after a bit of research, good old Wikipedia told me its name translates as ‘mixed rice’ giving me a basic idea of the dish. The lady serving me explained that the dish is brought to the table with ingredients being placed on top of rice in a hot stone bowl, this is then mixed together with the addition of chilli paste. Here the chilli paste is added at the table, maybe so, for people like me who are a bit feeble they can try it first! I found it fiery so I chickened out and only asked for a small amount. 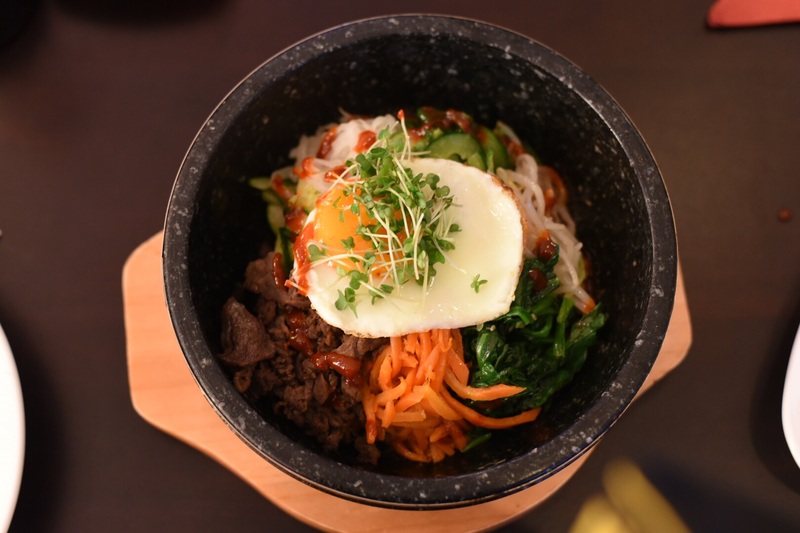 The Beef Dolsot Bibimbap (£8.50) came sizzling across, surely a clear sign of how hot its bowl was, with all the main ingredients topped with a perfectly fried egg! The bowls intense heat made the bottom of the rice become lovely, crisp and gnarly. The beef was tender, other main elements were thinly sliced courgettes, carrot, cabbage and cucumber, then bean sprouts and a spicy chilli paste. When mixed it was surprising how all the ingredients were still identifiable, but also married together well. 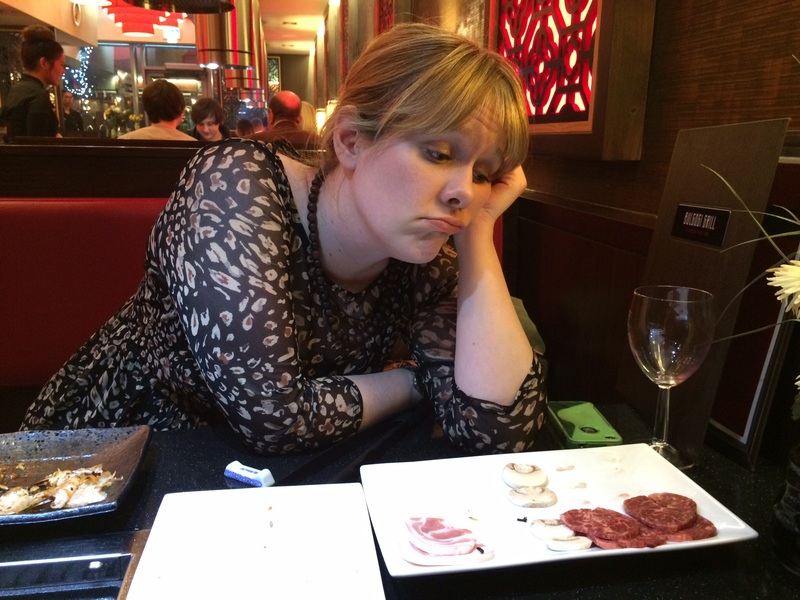 The whole thing was a really enjoyable belly full of food, I loved each mouthful and the bowl was left clean! Having never had it before, I could eat it again very easily, and knowing how spicy the chilli paste is when mixed, I’d probably be more liberal next time! 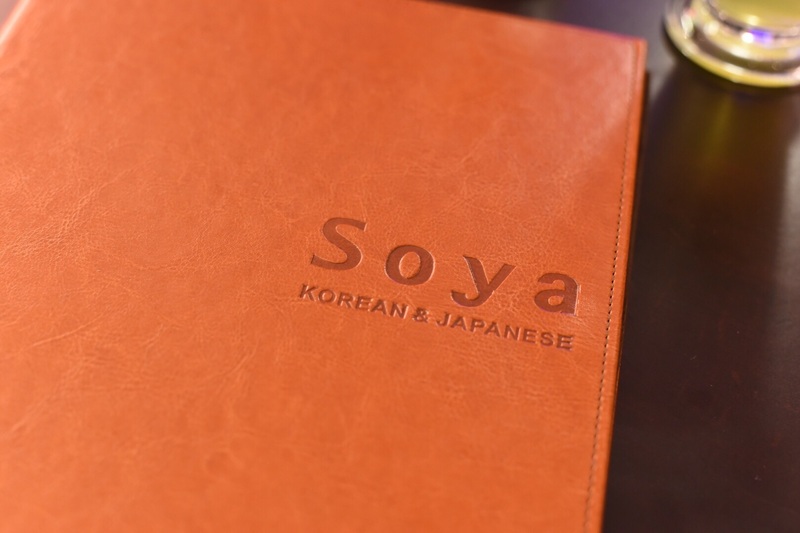 From a first visit I’d say that Soya is a great choice for dinner if you’re in the area; the service was everything you’d want – friendly without being overboard, efficient, helpful and they advised on the menu where needed. The food was incredibly tasty and there’s something to be said when you know you could eat a second portion of a dish immediately after the first!